In Japan, there are too many homes and not enough people to live in them. This housing glut – known as akiya – has led to homes being given away in some cases. Demand for homes in provincial towns, rural communities, and suburban areas is down. This is in part because of people gravitating toward cities. And if there is no demand, values plummet. There is no incentive to take on an old house that may have been inherited following the death of a relative, for example. And so houses stand empty. Local authorities find themselves in a Catch-22 situation – without owners’ permission, they cannot step in to enforce renovation or even the demolition of a vacant property. So, if someone moves to Tokyo, for example, but ends up inheriting a house in another town following the death of a relative, they may choose to ignore the inheritance, especially if they want to avoid having to pay the second-home tax levied in Japan. Unless the ownership of a property is known, authorities can’t take any action to demolish or purchase vacant houses, and there are no penalties for failing to register a change of ownership. But the biggest factor in all of this is demographic change. The size of the Japanese population grew exponentially in the 20th century from around 40 million to 127 million, but now it’s falling fast. At its current rate of decline, it will fall by a third to 85 million by 2100, and if that trend isn’t halted by 2300 there will be just 8.5 million Japanese people left. 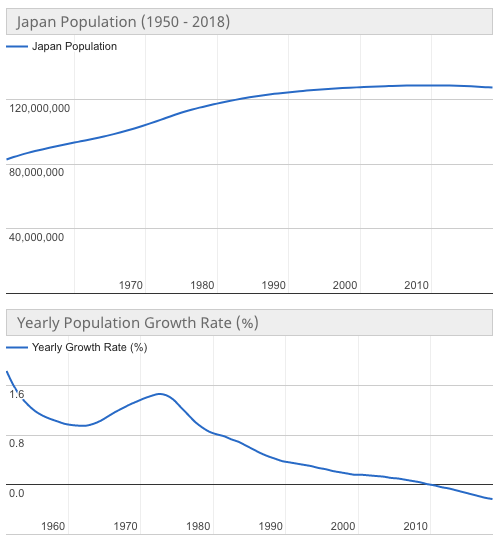 The rise and fall of Japan’s population. In 2008, there were 7.5 million empty homes in Japan. By 2013, it had reached 8.2 million. That number includes all empty dwellings – rooms to let, flats, and not just houses, of which there are believed to be around 2.2 million currently standing empty. Across Japan, real estate agents are offering free homes online, with new owners liable only for taxes and agents’ fees. Many of the homes are in need of repair, having stood empty for some time. But unless the country’s population decline goes into reverse, it is unlikely there will be an influx of demand for them – regardless of their non-existent asking price. Japan isn’t the only country trying to balance too many houses and too few people. In several rural parts of Italy, there have been a series of housing giveaways, including houses being sold for just €1. Perhaps that’s not surprising. With a median age of 46.3 years, Japan has the world’s oldest population. Italy comes second, with a median age of 45.9. Unlike Japan, Italy has a history of absorbing migrant populations into its own. While Japan has done relatively little to encourage outsiders to settle down, Italy has an estimated five million non-native members of the population. That’s around 8% of its current population. If Japan is to avoid catastrophic population declines, it may have to consider allowing more migrants to settle permanently. Can other economies avoid 'Japanification'?